While a Ph.D. student at Boston University, I had the opportunity to interview Ha Jin for a profile which was later published in the alumni magazine. Dr. Jin gave me two pieces of advice that significantly influenced choices I’ve made in my writing. The first piece of advice he gave me was to write about Asian America in my Doctorate dissertation, what later became the foundation of my book “Bollywood Weddings: Dating, Engagement and Marriage in Hindu America”. Click here to read my profile of Ha Jin, entitled “Risky Business: How Ha Jin is becoming an American writer”. On an unseasonably warm April morning, Xuefei Jin (GRS’94), better known by the pen name Ha Jin, relaxes in the shade on a bench facing the Charles River. The morning is quiet and serene, and so is Jin. His manner is understated and calm; a casual acquaintance might have trouble believing that he is the author of the bleak and irony-filled novel Waiting, which won the 1999 National Book Award. His demeanor suggests little of the tumultuous path that brought him from China to America and Boston University, nor of the risks he has taken, as both a writer and a human being, to get here. Jin has been a professor in the Graduate School’s Creative Writing Program since September 2002. He is an enviously prolific author, publishing a book of prose or poetry every one to two years, most recently The Crazed (2002). Known for his stinging criticisms of the Chinese government in the wake of the student-massacre at Tiananmen Square in 1989, writes solely in English, a language he didn’t learn until he was in his twenties-partly in protest of Chinese government censorship. Born in 1956 and raised mostly in a small rural town in Liaoning Province, Jin came of age just as China was entering the Cultural Revolution, and that era serves as a backdrop for many of his works. Jin recalls his mother being denounced for belonging to the “enemy class,” since her father was a landowner. Accused as a dissident, she was made to pick up trash and was later moved to the countryside to pick apples. Jin’s father, an officer in the People’s Liberation Army, was sent to a neighboring city to further the revolution. “The Cultural Revolution divided many families,” Jin says. Jin describes himself as “half-illiterate” before he joined the army, not knowing enough Chinese characters to read a book, but full of instinctual desire to learn. He spent his army years teaching himself to read and write in his native language, despite the prevailing antipathy toward “bourgeois” activities. Ironically, once he knew how to write, he was frequently asked to compose propaganda for the regime his literature would later critique. After leaving the army at 19, Jin worked as a telegraph operator for the Harbin Railroad Company, competing with 20,000 other railroad workers for a place in Heilongjiang University in Harbin. He was the only employee admitted, and although he was assigned to study English literature-his last choice for a major-he embraced the opportunity. He knew that most students accepted to university were admitted to technical or two-year colleges. He earned a B.A. in English in 1981 and then an M.A. in American literature at Shandong University, where he met his wife, Lisha Bein. In 1985 he moved to the United States on a scholarship from Brandeis University to work on his Ph.D. in English. It was normal for the Chinese government to fragment families to try to curb immigration, so Jin’s wife wasn’t permitted to leave the country until two years later. The couple’s son, Wen, stayed in China for two more years. When the massacre at Tiananmen Square occurred in 1989, “I thought China was closing its doors, so we were desperate to get [Wen] here.” They were prepared to bribe officials, but that proved unnecessary; in the disarray of post-Tiananmen Square China, government workers efficiently processed Jin’s visa request for Wen. Jin speaks often of his aspiration that Wen be “an American boy,” spared the bureaucratic cruelties and the suffering detailed in his novels. The poet Frank Bidart, Jin’s instructor at Brandeis, echoes that sentiment. He recalls reading the first poem Jin submitted to his workshop: “It was a remarkable experience to have someone turn in a poem at the end of the first class that I thought was astonishing. The poem was entirely there, and I had nothing tondo with it.” Bidart immediately called his editor and friend Jonathan Galassi at The Paris Review and recited the poem over the phone. The conversation concluded with Galassi agreeing to publish the poem. Jin expanded his team of writing mentors to include the novelist Leslie Epstein, director of BU’s Creative Writing Program. Jin audited one of Epstein’s classes, and Epstein says he knew within the first two weeks that Jin was a genius: “If any proof were needed, it was someone struggling to come to grips with the language, then managing to write a beautiful book like Ocean of Words,” a collection of army stories dedicated to Epstein for which Jin later won the PEN/Hemingway Award. After auditing more classes while he improved his English, Jin enrolled full time in the Creative Writing Program, and when he finished his degree, he had written every story in Under the Red Flag, a collection that won him the 1997 Flannery O’Connor Award for Short Fiction. He landed a job teaching poetry, fiction, and literature at Emory University in Atlanta in 1993. He spent a happy and productive near-decade there before he was lured back to BU as a full professor in the program that he’d once audited. The decision to write solely in English, Jin says, is seen as traitorous by some in China. He hopes his work will someday find a place in Chinese literature, but he defends his refusal to return to the country. “With China there are so many interferences; you can’t do anything. They edit out paragraphs and pages. Living as a writer in China means endless heartbreaks and heartache.” Jin’s parents and five siblings, still in China, are unaware of the extent of his success as a writer in America. 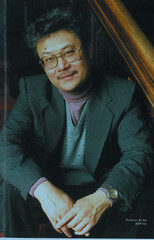 Jin became a naturalized U.S. citizen in 1997, but he does not consider himself a “hyphenated” Asian-American writer, since he has not yet published a work about America. His next novel, due to be released this fall, is War Trash (Pantheon), about Chinese prisoners held during the Korean War. The work contains Chinese-American characters, and he thinks it will function as a transition to a future book, one that is set in his new homeland, America.